Sat. #1 is HERE. To help the website out please subscribe to Mistah MegaManFan so we can reach 1,000 (current count: 822). If you're a gamer you'll enjoy the content. Don't miss Thursday Night AMP from this week! With the cheap plugs out of the way here's Saturday's latest wrestling news. 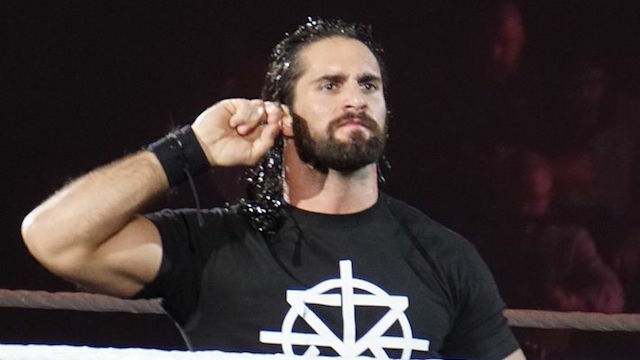 In this interview Seth Rollins says he nearly ended up in TNA: "I also get a call from, I wanna say it was D-Lo Brown was the first guy from TNA, he was producing TNA at the time and he knew my ROH contract was coming up. I think he was the first one to reach out to me and ask me if I'd be interested in going to TNA. And I was like, 'Well yeah, I'm interested in making more money and moving up, so, absolutely.' He's like, 'Alright, well if you don't mind, I'll put you in touch with Terry Taylor, who was doing all the hiring and the firing in TNA at the time. And so Terry calls me, and basically tells me he wants to offer me a three year deal to come to TNA for substantially more money, and far less dates than what I was having to do in Ring of Honor, and a much easier style. And so I was like, 'Oh, this sounds fantastic. This is great.' Mind you, I hadn't heard back from Johnny Ace yet. He hadn't called me, I couldn't get a hold of him, nothing. I get this contract from TNA and I basically agree to it verbally with Terry Taylor on the phone. I say, 'Oh yeah, it all looks great.' They fax over the contract. Before I sign the contract, I call Ring of Honor and let them know what I'm interested in doing with TNA. At the time, ROH is being booked by Jim Cornette. I don't know if you guys have any experience with 'ol Jimmy Cornette, but he's quite the trip and he lost his mind when I told him I was going to sign with TNA! There are so many expletives in the conversation that followed that I can't even repeat half of it. He was so irate,,, Cornette says, 'You know what? Just let me make sure they're doing you right. Send that contract over to me, send it to me before you sign it and send it back. I'm like, 'Sh-- Jim, alright, I'm just trying to make a buck, dawg. Sorry,' ya know? So I send him my contract, meanwhile, he's looking it over, and I'm like, you know what? I'm gonna call Johnny Ace one last time just to let him know don't worry about it. So I call him up, doesn't answer. I leave him one more voice mail and I tell him, 'Look, I got this contract with TNA and if I don't hear from ya, I'm probably gonna sign it and end up going there'. No joke, ten minutes later he calls me back. First time he calls me back in months. And he goes, 'Hi kid, uh, I just got your messages, sorry I've been so busy.' And he makes up all these excuses and stuff like that. Then he's like, 'Ah, you know what, I gotta talk to some people tomorrow but I'll give you a call. If you don't mind, I'll give you a call probably around lunch time tomorrow if that's okay.' And I'm like, 'Ah crap.' So I hang up with him, Cornette gives the contract back to me, he changed a couple little things in it. So then in the morning, I'm trying to get the new contract back to Terry Taylor so they can re-write it and send it back to me, so they do all of that. And now I'm waiting on this call from John Laurinaitis at lunch, and Laurinaitis finally calls me back. Meanwhile, Terry's trying to force me to sign this contract and I'm no-selling him on the back end of this, like, not trying to answer his calls. Finally, Laurinaitis calls me back and he gives me the old, 'Ah, kid, you know we don't give out jobs, we give out opportunities. So we got an opportunity for you down in Florida, if you're interested, it's just a developmental deal. There's no guarantees. We'll talk about pay and stuff like that.' And I'm like, immediately, I mean, it's where I always wanted to be. I didn't give a damn - I didn't if it was a job opportunity, I didn't care what it was, I just did not care. I'm in! I'm done." Via social media Impact Wrestling announced Rob Van Dam and Sabu are returning for United We Stand on April 4th for a tag team match against the Lucha Bros.
* Kayla Braxton is the ring announcer and stated they are sold out. * Matt Riddle defeated Dominick Dijakovic via submission. * Oney Lorcan & Danny Burch defeated Fabian Aichner & Marcel Barthel. * Candice LaRae defeated Deonna Purrazzo. * Jaxson Ryker defeated Mansoor. * WWE NXT Tag Team Champions The War Raiders defeated Wesley Blake & Steve Cutler. * Jeremy Borash is working ringside filming things for the company's Instagram feed. * Ricochet pinned Kassius Ohno after three standing shooting star presses. * Bianca Belair & Kairi Sane & Io Shirai defeated The Horsewomen when Belair pinned Marina Sharif. * Johnny Gargano pinned Velveteen Dream to keep the NXT North American Title after Tommaso Ciampa helped Gargano after a ref bump. Gargano and Ciampa double teamed Dream after the match until Ricochet saved him. Here Dean Ambrose talks about SUPER passionate fans: "One time, when I was first dating my now-wife, she lived in New York and sometimes, on the day off, we'd spend some time at her house, some time at my house depending on where in the country we were. So one time, I change my flight to go to New York. I didn't change it, I bought a new prime flight completely unrelated to the company travel. And when I landed in Newark, as soon as I got to the gate, there were like ten people there with all this Dean Ambrose stuff for me to sign. And for a second, I just woke up from the plane and I'm like, do I have a show today? What's going on? I thought I was going home? And I sign all their stuff and then I'm sitting in baggage claim, and I'm like, how do they know I was gonna be here? It was an autonomous decision by myself to buy my own new flight. How did they know? Because you hear there's leaks in the travel department, but I just did this on my own, so they have leaks in the airlines! And then this dude came up to me in baggage claim with some stuff, and he's like, 'Hey dude, I'm not trying to bother you dude, I'll give you $50 to sign these few things. I went, 'Keep your money, I'll sign these things for you but tell me how you knew I was here.' And he goes, 'Oh dude, we got like a whole system. Dude, we got a whole system and we got people everywhere.'" Speaking of Dean, Ambrose and Nia Jax are going to work a program on the house shows. I have a hard time believing this one but wrestlinginc.com/news/2019/02/ddp-on-much-he-made-when-he-was-on-top-in-wcw-650743/ DDP says Vince McMahon had no idea who he was when he came to WWE. Ring of Honor has announced rohwrestling.com/news/pco-brody-king-challenge-roh-world-tag-titles-17th-anniversary The Briscoes vs. PCO & Brody King for their 17th Anniversary show. Speaking of ROH a new Throwback Match is below. In addition new WWE related videos are available below. WWE has invited Becky Lynch (via the McMahons) to return to Raw: "Despite Stephanie McMahon's urging last week, Becky Lynch refused to allow WWE medical personnel to examine her injured knee and then struck both Stephanie and Triple H in consecutive nights. The Man has now been invited back to Raw by the McMahon Family in the wake of these controversial actions."